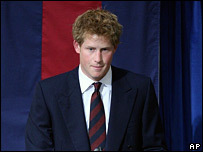 Prince Harry called Diana "our guardian, friend and protector"
Prince Harry has told a service to mark the 10th anniversary of the death of Diana, Princess of Wales, that she was "the best mother in the world". Family and friends joined Princes William and Harry for the service at Guards' Chapel near Buckingham Palace. Harry told the congregation, which included the Queen, Prince Philip and Prince Charles: "She made us and so many other people happy." 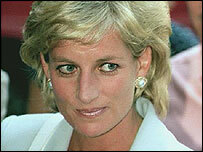 The Bishop of London said it was now time to "let Diana rest in peace". The Right Reverend Dr Richard Chartres, said the princess's memory should no longer be used to score points, and urged: "Let it end here." Harry, who was 12 when his mother was killed, said her death was "indescribably shocking and sad", and changed his life and that of his brother forever. He added: "When she was alive we completely took for granted her unrivalled love of life, laughter, fun and folly. "We both think of her every day. We speak about her and laugh together at all the memories." Prince William, who was 15 when Diana died, gave a reading from St Paul's letter to the Ephesians which asked for inner strength. Diana's sister, Lady Sarah McCorquodale, also gave a reading. The service included Diana's favourite classical music by composers Rachmaninov and Mozart and four hymns, concluding with Diana's favourite, I Vow To Thee, My Country. The service also included two prayers written by Archbishop of Canterbury Rowan Williams. Prime Minister Gordon Brown and his predecessors Tony Blair and John Major were accompanied by their wives to the service. The Duchess of Cornwall was invited to the hour-long memorial but decided not to attend, saying her presence would be a distraction. Former members of the princess's staff, all of the bridesmaids and page boys from her 1981 wedding, and over 110 representatives of charities and organisations with which she was associated were also on the guest list. Earlier, Harrods owner Mohamed Al Fayed, whose son Dodi died in the crash alongside the princess, laid flowers at a shrine he has built at the London store and held a two-minute silence. Other memorial services for the princess are being held at venues across the UK, including Manchester, Bristol, Aberdeen and Cardiff. Hundreds of people attended the Manchester service, which began at 1630 BST. 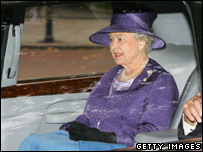 It included readings, a blessing, and music played at the princess's funeral. Admirers of the late princess have tied flowers and cards to the gates of Kensington Palace - her former London residence - as they did in 1997 after her death. Members of the public have also left bouquets and gifts at Althorp, where Diana is buried, at the gate of Sandringham estate in Norfolk where she was born. It was the first time Althorp had been opened on an anniversary of her death. Althorp is the home of Diana's brother, Earl Spencer. He invited charity workers, members of organisations supported by Diana and limited numbers of members of the public into the estate. Earl Spencer said: "This year, though, I wanted to invite, as my family's guests, representatives of those charities and groups particularly associated with Diana. "It seems a fitting way to remember her invaluable association with so many fine organisations." Several visitors had applied for tickets offered in a local newspaper. Betty Clarke, 80, of Northampton, said: "She's an icon and will never be forgotten. I was really glad to come and pay my respects." A service will be held at the nearby St Mary's Church, in Great Brington, on Friday night to give members of the local community and staff at the Althorp estate a chance to reflect on Diana's life. Tributes to the late princess have also been left near the Eternal Flame monument by the tunnel in Paris where she was killed. Princess Diana died, aged 36, along with her companion Dodi Al Fayed, 42, and chauffeur Henri Paul, when the Mercedes they were in crashed in the Pont de l'Alma tunnel on 31 August 1997. The princess's death provoked an unprecedented outpouring of national grief, with hundreds of thousands gathering to mourn outside Kensington Palace, where they left a sea of floral tributes.